This is an extension to Visual Studio for easy visual analysis of the "Could not load file or assembly or one of its dependencies" problem and issues related to referenced assemblies. The tool allows selecting a .Net assembly (.dll or .exe file) and get a graph of all referenced assemblies with hightlighted conflicting references. 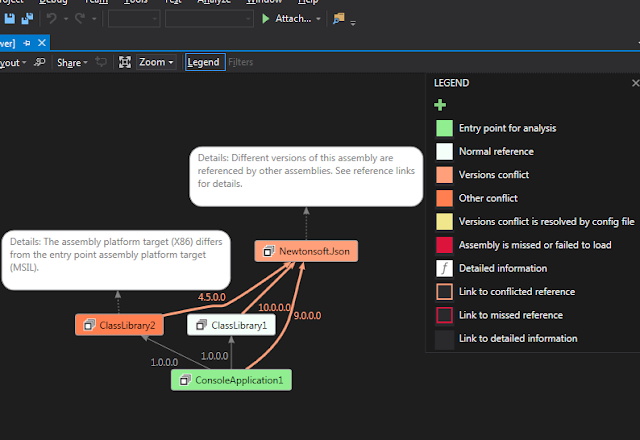 After installation, it is available in the main menu: Tools -> Analyze Assembly Dependencies. Assembly to analyse: .Net DLL or EXE file which dependencies should be analysed. Related config file: .exe.config for EXE file or web.config in case a web application DLL is selected. The extension inserts the related config automatically after the assembly is selected but it is also possible to select it manually. Ignore system assemblies: by default the tool ignores assemblies which names start with "System..." to keep the graph clear. Note: the extension relies on the built-in DGML editor. In case you see the raw XML instead of the diagram run Visual Studio Installer, then: Modify -> Individual Components -> Code Tools -> Install DGML editor.